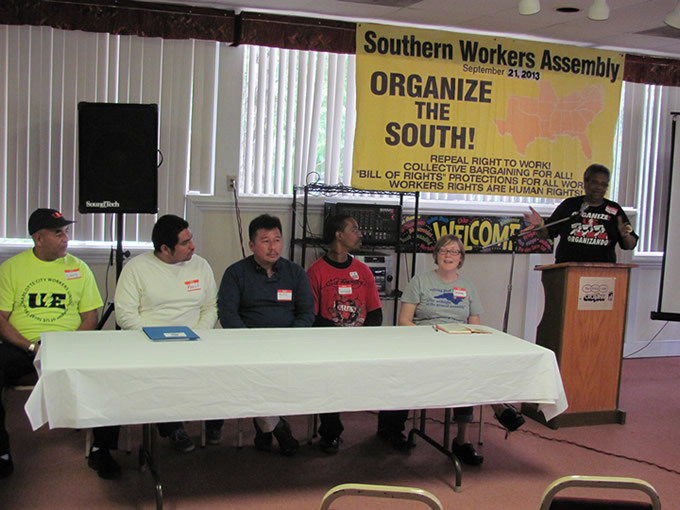 Raleigh, N.C. — Workers from across North Carolina joined together on Sept. 21 for a statewide Workers Fightback Conference hosted by the Southern Workers Assembly. In the last few months, over 940 people were arrested in protests at the State Capitol and tens of thousands took to the streets as part of the Moral Monday movement. At the same time, the SWA was building a campaign to elevate the struggles for workers’ rights, including having many rank-and-file workers arrested in the civil disobedience actions. Gathered for this important conference were members of the N.C. Public Service Workers Union-UE Local 150; the N.C. Association of Educators, the Farm Labor Organizing Committee of the AFL-CIO, the Carolina Workers Organizing Committee (which is helping fast-food workers organize), OUR Walmart of the United Food and Commercial Workers, the International Alliance of Theatrical and Stage Employees Local 322, as well as unorganized workers, the unemployed, youth, and community and faith leaders. Conference participants discussed how workers’ democracy and power must be promoted as an essential tenet of a democratic society. This is especially important now, with the attacks on democracy driven by the economic crisis and the capitalist push for austerity given as a solution. According to a conference document, “North Carolina workers and workers throughout the South, in addition to having the worst labor laws and anti-union climate in the country, are now undergoing further attacks on workers’ rights. N.C. is a testing ground for the introduction and passage of the most extreme right-wing and racist laws. Its open declaration of corporate control of state government was made clear by the governor’s appointment of multimillionaire Art Pope — who is the state’s single largest donor and a founding board member of the Koch brothers’ Americans for Prosperity and Tea Party — in charge of the state’s budget as deputy budget director. An opening panel of the conference focused on the struggle of workers to fight for family-supporting wages. The “Low Wages Have to Go!” panel featured Jessica Benton, a Millbrook Elementary School teacher and member of NCAE and Organize 2020; Terrance Kellon, a fast-food worker with Carolina Workers Organizing Committee; Meliton Hernandez, a 14-year farmworker with the Farm Labor Organizing Committee; and Larry Mackey, a utilities worker in the city of Charlotte and member of UE Local 150. Workers in North Carolina have no majority sign-up or collective bargaining rights. The conference discussed how to build campaigns that elevate rights at work and also working conditions, using Workers Bill of Rights campaigns. Currently being utilized by state mental health workers and municipal workers in UE Local 150, such campaigns can be a major step forward in the process of building collaboration between groups in the labor movement. In the closing section of the conference, participants adopted a six-month plan to develop local Workers Assemblies in Charlotte, Goldsboro and Durham, N.C., to bring workers in those areas together to discuss actions and local working conditions as part of a Workers Democracy Campaign.